WASHINGTON — Secretary of Defense Chuck Hagel announced Sept. 22 that President Obama has nominated Navy Adm. Harry B. Harris Jr. for reappointment to the rank of admiral and for assignment as commander of the U.S. Pacific Command, based in Honolulu. 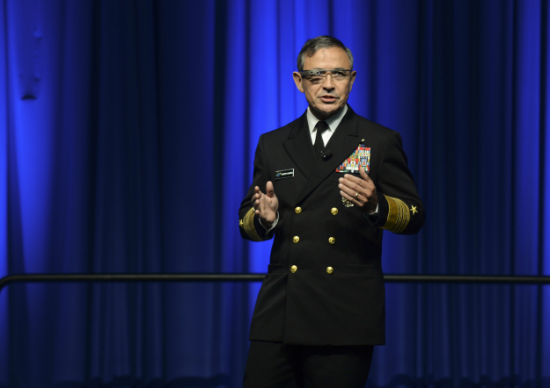 Harris is currently serving as commander of the U.S. Pacific Fleet, based at Pearl Harbor. Sen. Mazie Hirono (D-Hawaii), a member of the Senate Armed Services Committee, said in a statement, “Adm. Harris’ distinguished career of service to our country and strong leadership displayed in his current role as commander of the U.S. Pacific Fleet demonstrates that he will excel in his new role as Pacific commander. Born in Japan and raised in Tennessee and Florida, Harris is the highest-ranking Asian American in the history of the Navy and the first to attain the rank of four-star admiral. A graduate of the U.S. Naval Academy, he has served as commander for the U.S. Pacific Fleet since October 2013. Following graduation from the U.S. Naval Academy in 1978 and designation as a naval flight officer, he was assigned to VP-44. His subsequent operational tours include tactical action officer aboard USS Saratoga (CV 60); operations officer in VP-4 at Barbers Point, Hawaii; three tours with Patrol and Reconnaissance Wing 1 at Kami Seya, Japan; director of operations for U.S. 5th Fleet at Manama, Bahrain; and director of operations for U.S. Southern Command. Harris commanded VP-46, Patrol and Reconnaissance Wing 1, Joint Task Force-Guantanamo, the U.S. 6th Fleet, and Striking and Support Forces NATO. He has served in every geographic combatant command region, and participated in the following major operations: S.S. Achille Lauro terrorist hijacking incident, Attain Document Ⅲ (Libya, 1986), Earnest Will (Kuwaiti reflagged tanker ops, 1987-88), Desert Shield/Desert Storm, Southern Watch, Enduring Freedom, Iraqi Freedom, Willing Spirit (Colombia hostage rescue, 2006-7), and Odyssey Dawn (Libya, 2011). For Odyssey Dawn, he served as the Joint Force Maritime Component commander afloat. Harris’ graduate education focused on East Asia security. He attended Harvard’s Kennedy School of Government, Georgetown’s School of Foreign Service, and Oxford University. He was an MIT Seminar 21 fellow. His staff assignments include aide to commander, U.S. Naval Forces Japan; chief speechwriter for the chairman of the Joint Chiefs of Staff (JCS); and three tours on the Navy staff, including as an action officer in the Strategic Concepts Branch, director for the current operations and anti-terrorism/force protection division, and deputy CNO for communication networks (OPNAV N6). In October 2011, he was assigned as the assistant to the chairman of the JCS and served as the chairman’s direct representative to the secretary of state and as the U.S. roadmap monitor for the Mid-East peace process. Harris has logged 4,400 flight hours, including more than 400 combat hours, in maritime patrol and reconnaissance aircraft. His personal decorations include the Defense Distinguished Service Medal, two Distinguished Service Medals, three Defense Superior Service Medals, three Legions of Merit, two Bronze Stars, the Air Medal (one strike/flight), and the State Department’s Distinguished Honor Award. He is a recipient of the Navy League’s Stephen Decatur Award for Operational Competence. For his work in diversity and leadership, he has also received the NECO Ellis Island Honor Award, the APAICS Lifetime Achievement Award, and the WWAAC Community Spirit Award.